I was born in the United States immediately after my parents arrived here from India. I was raised in a strong Hindu culture, attended weekly pujas, or ceremonial rites, and read the Vedic scriptures. Though my prayers were a childs constant stream of requests and broken promises, Hinduism provided me with moral guidance and spiritual comfort. It never occurred to me that I should consider any other religion; to be a Hindu was an aspect of my Indian identity. A childhood friend, a Southern Baptist intent on converting the world, first introduced me to Christianity by telling me "you and your parents are going to hell." I was hardly convinced. My friends exhortations did, however, prompt me to investigate my Hindu faith and motivated me to read the Bhagavad-Gita. Although I found the stories fascinating and the writing magnificent, I was uncomfortable when Krishna convinced a reluctant Arjuna to secure his rightful inheritance by making war against his cousins. Though I did not like seeing a deity advocate violence, this feeling was not enough to reject an entire faith. I wanted to examine Hinduism on its own merits and doctrines. The second tenet is that all religions are equally valid paths to the same God. This strips one of the right to criticize any set of religious beliefs, including those of cults and other extreme groups. Thus, God is not concerned with having His followers believe in truth. It is sincerity, and not content, that matters. Yet I had had for years a sincere prayer life and still felt a void in my religious faith. Though I was searching for an objectively true faith that would lead me to God, I was beginning to doubt this existed and was ready to accept the "philosophies," if not the religious beliefs, associated with Hinduism. My journey from Hinduism to Christianity was a gradual and painful one. I was touched by the love and simplicity of a Christian girl who dreamt of becoming a Supreme Court justice so she could stop her country from "killing unborn babies." I was also angered by the arrogance of my Southern Baptist friend who claimed his faith was the one true path to God. He seemed to deny the experiences of billions of people who have never seen a copy of the Bible. I began reading the Bible to disprove the Christian faith I was learning both to admire and despise. I cannot begin to describe my feelings when I first read the New Testament texts. I saw myself in many of the parables and felt as if the Bible had been written especially for me. After reading every book I could find on the historical accuracy of the Bible and Christianity, I was convinced that the Bible had remained unaltered throughout the centuries and that circumstances surrounding Christs death led to the conversions of thousands. However, my perspective remained intellectual and not spiritual. My investigation of Christianity might have remained at this theoretical level had it not been for a short black-and-white film. Though its depiction of the crucifixion was harsher than that of many similar movies, something about this film hit me very hard. For the first time, I actually imagined what it meant for the Son of God to be humiliated and even killed for my sake. Although the movie did not convince me that anything was true, it did force me to wonder if Christians were right. I realized that if the Gospel stories were true, if Christ really was the Son of God, it was arrogant of me to reject Him and question the gift of salvation. The motivation behind my conversion, however, was my belief in one, objectively true faith. If Christianity is merely one of many equally valid religions, then the sacrifices I made, including the loss of my familys peace, were senseless. I was comfortable in my Hindu faith and enjoyed an active prayer life; I only gradually felt a void and stubbornly resisted Gods call from within the church. It was Truth and Love that finally forced me to accept Christ as Lord. "Jesus said to him, I am the way and the truth and the life: No one comes to the Father except through me" (In. 14:6). Christs redemptive sacrifice proved that God loved me and was lifting me up to Him. Obviously you do not really understand the message of Sri Krishna in the Gita, nor the circumstance. 1. The circumstance - It was not really about rightful inheritance, that was a side result of Arjuna making war on his cousins. Arjuna was to make war on his cousins to protect Dharma (dharmayudh), the Law of the Divine, from his cousins who represented all the errors of the ego. 2. The message - what SriKrishna was saying to Arjuna, is that even while killing his cousins, it was only the body that was dying, not the Soul, as the Soul is eternal, imperishable. Thus while he was indeed urging a Dharmayudh, it was with the knowledge that a more egregious form of violence, that against the Soul, is impossible. And if you think that Christianity does not have its violent God, you are having a laugh...or perhaps you are being a bit insincere. There is great joy in heaven when even one soul comes to the truth. And what is "truth"? Jesus said, "I am the Way, the Truth, and the Life." And there is only one Church that has preserved the "truth" of Jesus since His apostles took his word out into the world. Bobby has found the truth. We are proud that he has become our governor. I am also an Indian so I want to say that it is very good to hear one person has come to faith. His way of speaking is not very good but God works through him. When anyone comes to Jesus he hears the truth, and truth gives him new life away from all old traditions and faiths. 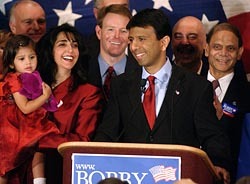 The Signs Of the Times blurb in the November 5, 2007 issue of America concerning Louisiana govenor elect Bobby Jindal hit really home for me given the otherwise happy ocasion that my Lutheran (close to Catholic)son is married to another young physician researcher at Stanford Hospital and the School of Medicine. They have a son, who is being not unreasonably raised in the Hindu trdition according to the faith of his mother, Uma. Despite my respect for the Hindu faith as I have experienced it through Uma's family, I cannot but feel tormented by the fact that Volker (my son has a Bavarian mother) has not been baptized in the Catholic faith of my son's side of the famly. This fear is intensified by the face that Uma's younger brother converted to Mormonism while he was doing his own residency, to me an unsatisfactory outcome. The article is simply beautiful and I could see that it was a true search for the truth. He couldn't compromise in accepting it when he found it. I am also an Indian, a Hindu by culture but a Christian by faith.